Organic goji berries are so deliciously sweet and tasty that most of us don’t need an excuse to devour them by the handful! Yet, did you know that there are now three extremely compelling reasons for enjoying even more of this nutritious super fruit than ever before? Organic goji berries are small red berries (similar in size to raisins) that grow on the Box Thorn (Lycium barbarum) – a deciduous perennial shrub that is native to the Himalayas, widely cultivated in protected Mongolian and Tibetan valleys, and today grows wild in some parts of Europe. Treasured for their beneficial health effects since as long ago as 800 AD, organic goji berries are one of the most nutrient-dense fruits on earth and are traditionally regarded as life prolonging, strength building and libido enhancing. Antioxidants – which help to boost our immune system and lower cholesterol levels. Amino acids – organic goji berries contain 18 types of amino acids, (which is six times more than bee pollen), as well as all 8 essential amino acids. 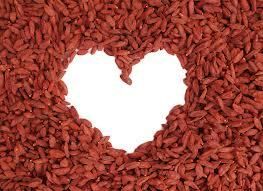 Carotenoids – organic goji berries are loaded with beta-carotene and zeaxanthin, which help to improve our vision. Polysaccharides – which boost our immune system, inhibit fungal infections and stimulate the release of rejuvenation and growth hormones from the pituitary gland. Beta-sisterol – which possesses anti-inflammatory properties. Vitamins and minerals – including the vitamins, B1, B2, B6, C, and E, and the minerals zinc, iron, copper, calcium, selenium and phosphorus. Organic goji berries are a powerful adaptogen that can help to reduce stress and cortisol levels, thus enabling our body to burn more fat for energy. They also help to lower both blood pressure and cholesterol levels, stimulate blood circulation, protect our liver and kidneys, prevent lethargy, fatigue and headaches, can aid in the promotion of a sound nights sleep, and are known to have a positive effect on mood. More recently organic goji berries have been linked to demonstrable weight loss – that’s because organic goji berries boast an extremely low Glycaemic Index rating (the numerical scale that measures the speed at which a chosen food converts to blood sugar) of just 29, which means that they can help to satisfy hunger, whilst simultaneously reducing our cravings for sugar. In addition, organic goji berries consist of around 21 percent fibre, which actively encourages regular bowel movements, helps to decelerate digestion and leaves us feeling fuller for longer. Famous British author, Jeanette Winterson, once penned a book titled, ‘Oranges Are Not The Only Fruit’, and this couldn’t be more true – indeed, just one gram of organic goji berries contains a whopping 500 times more vitamin C than the same weight in oranges! In fact organic goji berries are the richest source of vitamin C on our planet. Vitamin C (also known as ascorbic acid) cannot be manufactured by our body and must therefore come from our food supply. A lack of vitamin C can cause a condition known as scurvy, which results in muscle and joint pain, lethargy, skin rash and bleeding and swelling of the gums. Vitamin C performs several key functions, such as helping to protect our cells and keep them healthy, aiding in the healing of wounds and it is vital for the maintenance of healthy connective tissue. Vitamin C also assists in the manufacture of collagen, a natural substance that is known to reduce fine lines and wrinkles and helps to keep our skin looking younger for longer. A study by the American Journal of Clinical Nutrition in 2007 proved that those who eat foods rich in vitamin C have demonstrably fewer wrinkles and less age related, dry skin than those who don’t. And vitamin C has long been associated with a healthy immune system – according to Mark Moyad, the lead researcher of a recent study published in Seminars in Preventive and Alternative Medicine, which analysed 100 studies over 10 years, ‘higher levels of vitamin C may be the ideal nutrition marker for overall health’. He claims that ‘the more we study vitamin C, the better our understanding of how diverse it is in protecting our health from cardiovascular, cancer, stroke, eye health and immunity to living longer’. The richest source of carotenoids there is, organic goji berries boast almost 8 mg of beta-carotene per 100 grams, which is more even than carrots. Beta-carotene is the red / orange pigment that gives yellow and orange fruit and vegetables their distinctive colour. Our body converts beta-carotene into vitamin A, which strengthens our immunity against infection, aids vision in dim light and keeps skin and the lining of certain parts of our body, such as the nose, healthy. As well as being vital for scotopic (vision under low light conditions) and colour vision, vitamin A is also beneficial in the treatment of skin disorders, such as acne, and combatting diseases caused by viruses, including measles, respiratory viruses, and the HIV virus. Scientific research on cellular immunity in mice, published in the Journal of Nutrition in 1987, concluded that a vitamin A deficiency is linked to a functional immune system defect. It has also been observed that stroke victims who enjoy high levels of vitamin A in their diet are less likely to die or suffer disabilities as a result. And a Dutch study recently revealed that the consumption of beta-carotene positively reduces the risk of macular degeneration, which is a major cause of blindness. Excellent news for vegetarians and vegans, organic goji berries contain around 11 mg of iron per every 100 grams, far more than your average slice of cow. Iron is an essential mineral that helps to make red blood cells, which carry oxygen around our body. A lack of iron can lead to a reduction in the number of red blood cells and cause a condition known as anaemia, which manifests in tiredness and lethargy, shortness of breath, heart palpitations and a noticeably pale complexion. Left untreated, an iron deficiency can leave you more susceptible to illness and infection, and may increase your risk of developing complications that affect the heart or lungs, such as tachycardia (an abnormally fast heartbeat) and even heart failure. According to Elaine Chottiner, MD, clinical assistant professor and director of General Hematology Clinics at the University of Michigan Medical Center, ‘iron is also necessary to maintain healthy cells, skin, hair, and nails’. And, as iron is a key component of hemoglobin (which transports oxygen to other cells in our body), it plays an important role in energy production and muscle function. Fortunately those foods that contain high levels of vitamin C, such as organic goji berries, also aid in the absorption of iron, meaning that you get to reap double the rewards from one irresistible serving! Go for organic goji berries! Organic Goji berries are never handled during harvest, and are instead shaken onto mats and dried naturally in the shade. This not only prevents them from oxidising, it also retains their wonderfully intense flavour that many liken to a cross between cranberries and cherries. Organic goji berries taste utterly delicious just as they are, or added to fruit and nut trail mix for a wholesome raw snack on the go. Soaked organic goji berries can be used to prepare a rejuvenating tea or mixed into your favourite smoothies, shakes and protein drinks. Alternatively, organic goji berries make an ideal additional ingredient in a limitless range of yummy rawfood recipes, including energy bars, raw chocolate, cakes and desserts. The post Organic goji berries – 3 great reasons to eat more of them appeared first on Superfood blog - Healthy, Rawfood Lifestyle.